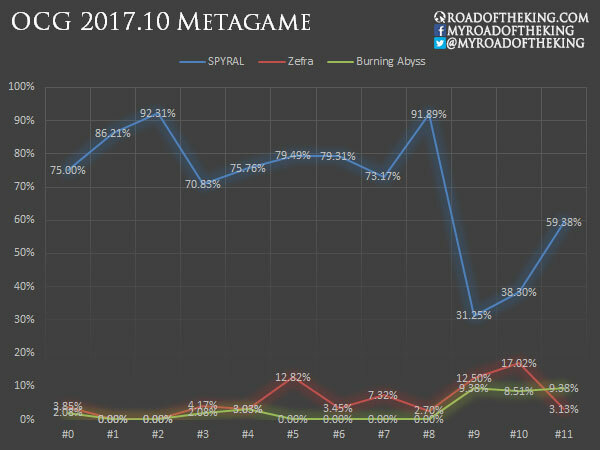 Welcome to Week #11 of the OCG 2017.10 format. This report will cover 32 top-performing decks from 5 tournaments that were held in Japan, Taiwan, Philippines and China during 9 – 10 December 2017. 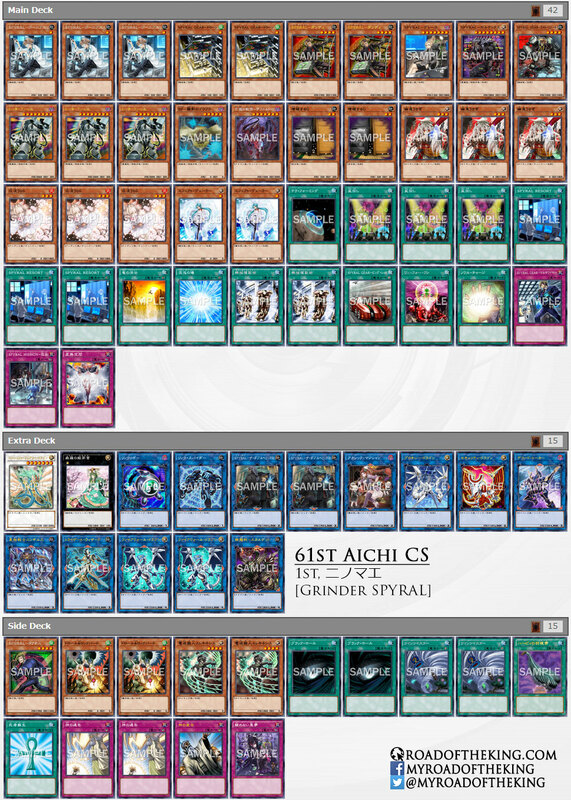 Ninomae (ニノマエ) played Grinder SPYRAL in the “61st Aichi CS” which had 111 participants. He went 7-0 and finished in 1st place. In his Side Deck, he ran 2 copies of Electronic Transimulation Wattkinesis, a new “Hand Trap” from Extreme Force. Electronic Transimulation Wattkinesis‘ effect shifts an opponent monster to another of their Main Monster Zone. Aromaseraphy Jasmine has 2 downwards pointing Link Arrows, so by moving it to the Main Monster Zone, that would effectively disable the (2) effect. By moving Topologic Bomber Dragon to the Main Monster Zone, that would also prevent the FTK with Phoenixian Cluster Amaryllis. But outside of this very niche application against Plant FTK, Effect Veiler is a much better choice with a wider scope. 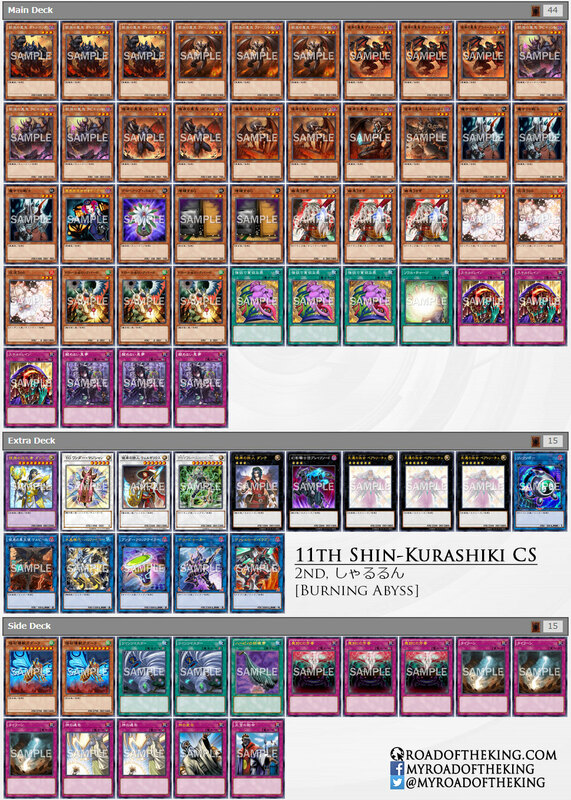 Sharurun (しゃるるん) played Burning Abyss in the “11th Shin-Kurashiki CS”, which had 32 teams (96 participants). He went 7-1 and finished in 2nd place. While the typical Burning Abyss build mainly has just Farfa, Malebranche of the Burning Abyss‘s effect (through Beatrice, Lady of the Eternal) as disruption during the opponent’s turn, Sharurun has tuned his deck to make use of Crystron Needlefiber for additional disruption. During the opponent’s turn, Crystron Needlefiber‘s effect can Special Summon T.G. Wonder Magician to destroy an opponent’s Spell/Trap Card, and then together with a DARK Fiend monster special summoned by Libic, Malebranche of the Burning Abyss, they can be used to Synchro Summon PSY-Framelord Omega. Omega’s effect could then banish a random card from the opponent’s hand. If a “Malebranche of the Burning Abyss” monster was Special Summoned by Libic, then it would have its effect negated and thus it would not be destroyed by its own (2) effect. This allows the “Malebranche of the Burning Abyss” monster to co-exist on the field with T.G. Wonder Magician. 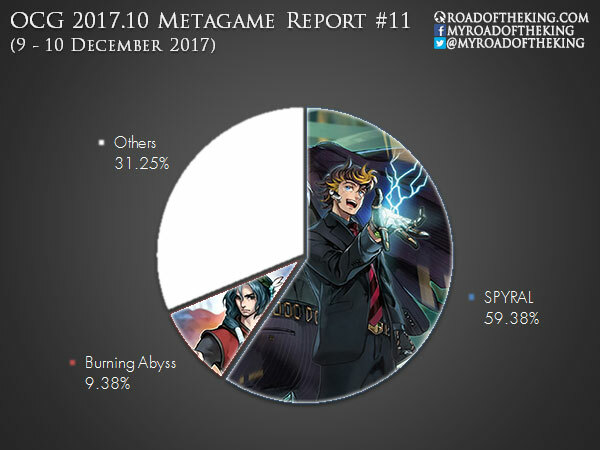 Japanese tournaments are seeing a variety of decks among their top-cut, but the Asia Championship Winter 2018 Taiwan and Philippines Qualifiers were heavily dominated by SPYRAL. The new OCG 2018.01 Limit Regulation was announced earlier on Monday, and most Japanese unsanctioned tournaments would be switching over to it in the coming weekends. The remaining Asia Championship Winter 2018 Qualifiers for Singapore, Thailand and Malaysia will be played on the current OCG 2017.10 Limit Regulation. As the Hong Kong Qualifier is held on 1 January 2018, it will be the only Asia Championship Winter 2018 Qualifier to be played on the new OCG 2018.01 Limit Regulation. Zefra falling off? Did they break that threat easily? D/D Kaiju Needlefiber and Genex Atlantean Mermail decklists, please?